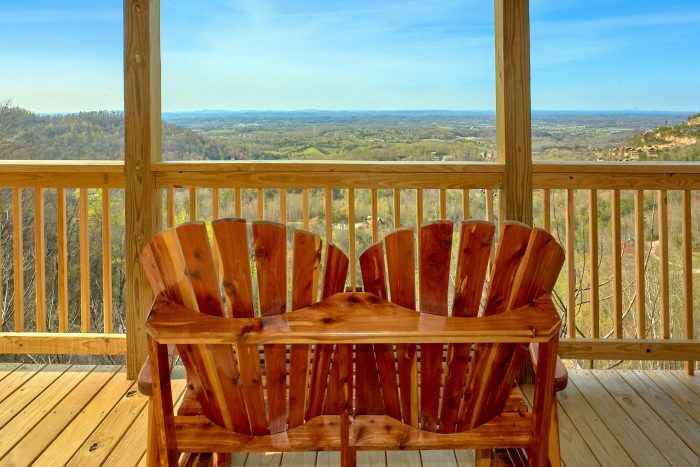 For a one of a kind Smoky Mountain vacation, why not book a log cabin that comes with a beautiful view, a game room, a resort pool, theater system, and an excellent location near Dollywood? 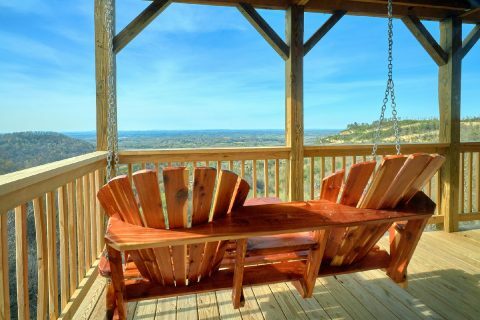 You can do exactly that when you reserve "Fifty Mile View!" 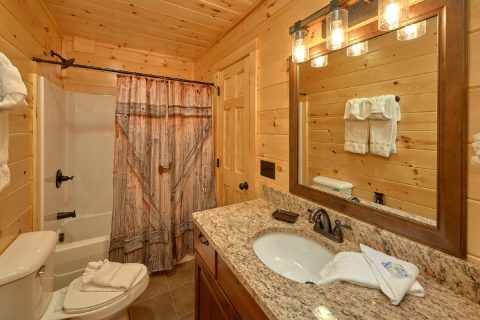 Nestled in the Hidden Springs Resort area, your Smoky Mountain cabin not only provides you with quick access to Dollywood and Pigeon Forge, but you'll also love having resort indoor swimming pool access! 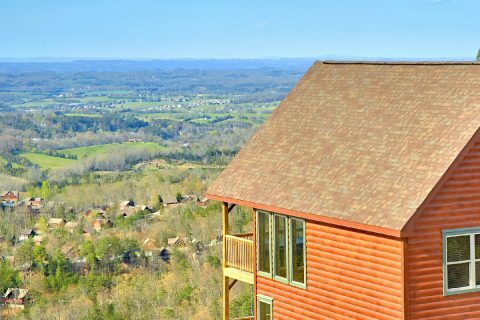 Once you experience the mountain vistas of "Fifty Mile View," you'll be glad that you booked this luxury 2-bedroom cabin in the mountains. 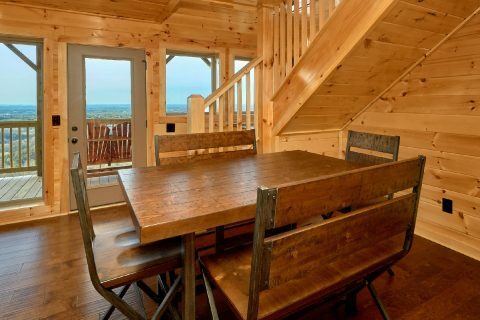 Even better, with room for 6 guests, you can share this beautiful cabin with your closest friends and family. 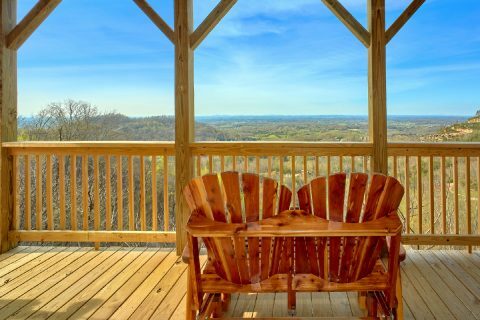 From the main level, you can admire your rental's beautiful views through floor-to-ceiling windows while you sip your morning coffee. 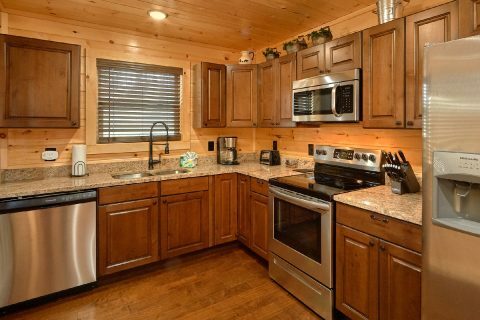 The nearby kitchen is a great place to make delicious meals to enjoy on your vacation. 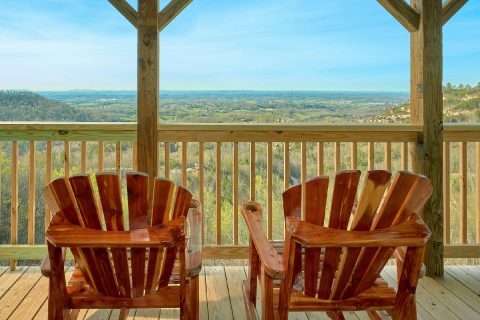 There's also a charcoal grill for having a summer cookout at your cabin! 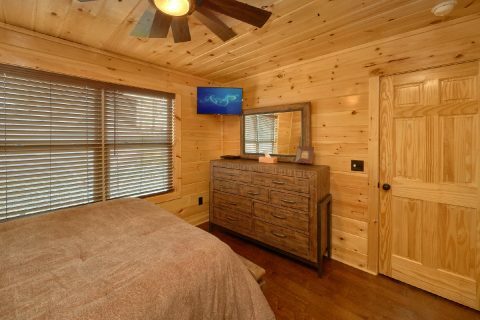 This floor is also home to the in-cabin theater system that includes a 54" television, surround sound, and a DVD player. 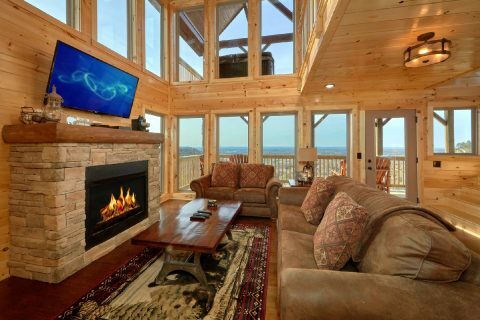 Relax on your rental's comfortable leather couches and watch your favorite films and shows while you stay warm by the gas fireplace. 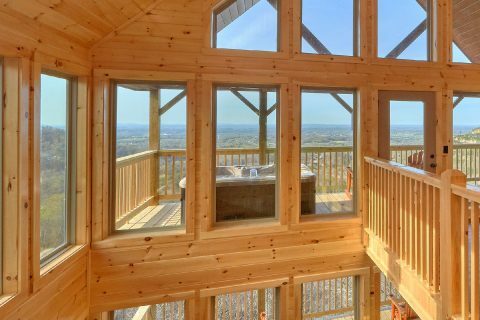 There's plenty of fun to be had in the upstairs game room. 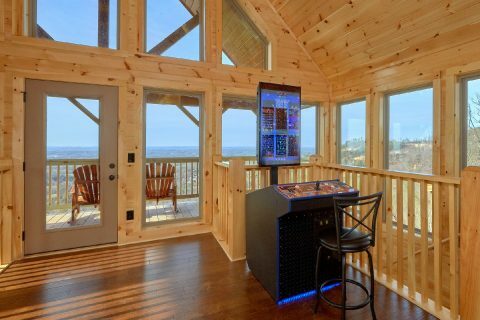 This open loft area features board games and a classic arcade game with 60+ games! 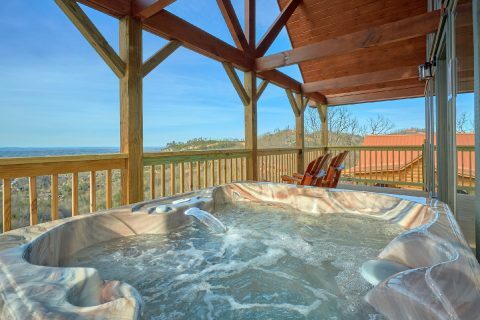 From here, you can step out onto your cabin's deck to take a relaxing dip in your rental's 4-person hot tub or sit back in a porch rocking chair. 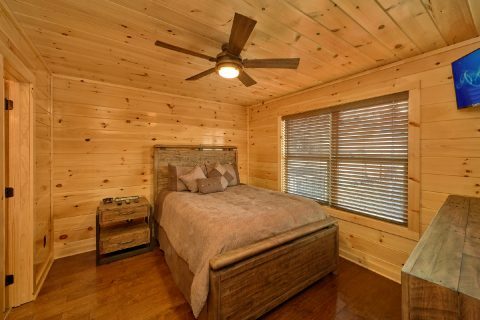 For getting a great night's rest, you rental offers one king sized and one queen sized bedrooms on separate levels of the rental. 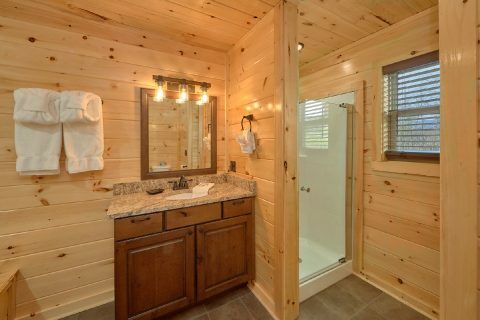 Both of these come complete with private televisions and a bathroom. 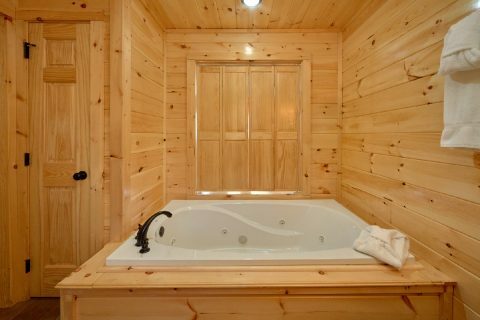 The upstairs loft bedroom even features a canopy bed and a jetted jacuzzi tub for enjoying romance on your cabin vacation. 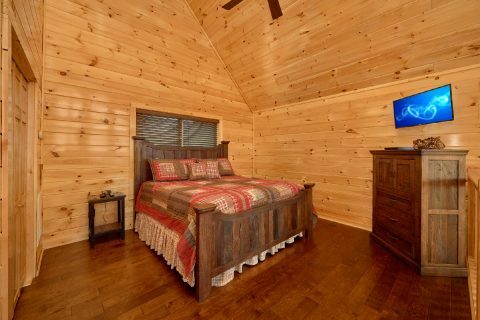 For accommodating more guests, there is also a sofa sleeper in the living room. Whether you plan to explore the Smoky Mountains, ride roller coasters at Dollywood, or just watch beautiful days pass lazily by at your premium log cabin, you're bound to have a fantastic stay at "Fifty Mile View!" 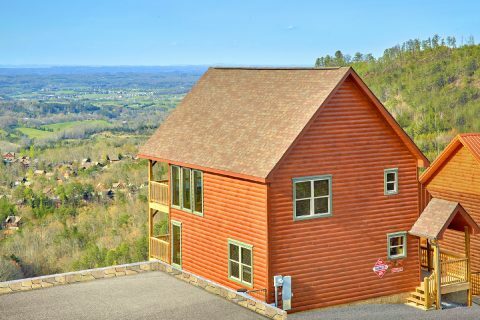 Don't forget to book online with Cabins USA Gatlinburg to save on your vacation with a discount!